Want to feel closer to Nature and feel the freshness of the natural surroundings? Want to hear the roar of the wild elephants and see them like you could touch them? Seems too good to believe? NO, right here in our own country India in the heart of the wilderness in the forests of Southern India lies a land called Thekkady. Approachable from Cochin the city in South Indian in Kerala, this pristine land of green expanse in the best attraction in a Kerala tour. Located near the border of Tamil Nadu and Kerala, the town of Kumily finds itself situated around 257 km from the capital city of Trivandrum. The vast virgin expanse of greenery here is what makes up the wildlife sanctuary called Thekkady. The dense forests, the deciduous beauties, and the savanna grass lands lend beauty to the eye and the collection of wild animals that live here in togetherness is the main attraction in Thekkady. Tigers, elephants, gaur, Nilgiri Langurs and the lion tailed Macaques, all these and more are the animals found here to name just a few. Here is where you find the Periyar Wildlife Sanctuary that lies here with its lovely dense forests of evergreen trees. This was a park earlier and became a tiger reserve in the year 1978. The beautiful lake here created artificially on the Mullaiperiyar Dam across the majestic River Periyar has a charm of its own. The herds of wild elephants that we get to see here is the main tourist attraction here and Thekkady is frequented only for this lovely sight. With the elephants coming to the nearby lakes to quench their thirst, the long wait to see these huge but innocent animals is the main experience of coming to Thekkady. A perfect spice paradise with the cardamom, clove, black pepper and clove available here in plenty, the Thekkady Lake overlooks the Periyar Wildlife Sanctuary. With its exotic flora and fauna, the place also gives you a bamboo rafting tour along the River Periyar. At Murrikakady you will find the plantations of spice and coffee. This is around 5 km from the pristine locales of Thekkady. At Chellar Kovil you have the lovely sight of the majestic waterfalls and beautiful cascades. The scenic splendor is terrific and the atmosphere absolutely calm. Annakara is another tourist hotspot with its upcoming spice popularity. In fact very soon we could have an airport at Annakkara. The Mangala Devi Temple of Thekkady is frequented by anyone who comes here and the ambience is the perfect antidote for a tired soul. The panoramic view from the temple gives a great spectacle of the Ghats on the eastern side and the small little villages too. With the adventurous elephant rides, lake cruises and beautiful hikes, Thekkady is one spot that you shouldn’t miss in India. Photographers would love to let their hair down here and go berserk taking the best kind of photos ever and nature lovers wouldn’t want to go back from this place. 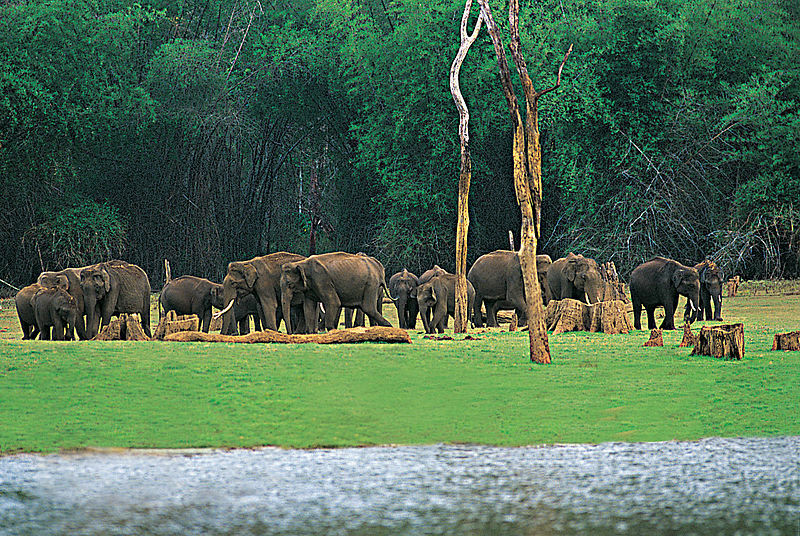 Thekkady is the land of elephants, adventure, fun and enjoyment. Visit it.